It's hard enough to fight acne. But what is a person to do if these breakouts leave long lasting marks and scars on the skin? Acne scars result from constant damage to the skin due to acne pustules and papules, pimples/zits, cysts etc. Each pimple is associated with an inflammatory reaction, which causes local tissue damage when combating bacteria trapped in the clogged pores of the skin. On top of this, if you squeeze or pop pimples, this damage may be even more substantial. When you get a cut on your skin, a scab starts to form, which actually helps it to heal. Acne pimples that become inflamed are like little cuts that need to heal; with chronic acne, repeat pimples and inflammation don't give enough time for the skin to heal properly. Therefore, the FIRST thing that must been done to break the cycle of creating new scars and marks (acne marks are also acne scars but less deep) is to PREVENT acne. This will allow collagen production and new tissue to rebuild your skin (at least partially) and as a result, make scars less visible, and marks vanish. So, PREVENTING NEW ACNE FROM FORMING IS THE FIRST CRUCIAL STEP TO GETTING RID OF ACNE SCARS AND MARKS. 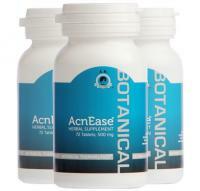 AcnEase® prevents pimples from forming and reduces the number of pimples that progress to inflammatory pustules, thereby preventing skin damage. By reducing the new damage to skin, your body can work on repairing the skin and reducing overall scarring. 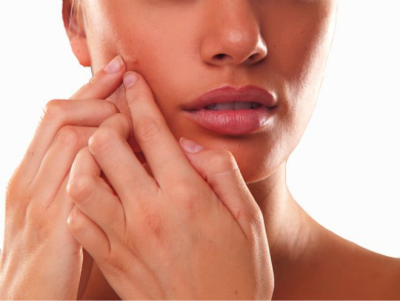 After your skin heals and no new pimples or cysts are forming, there are some options that increase skin turn-over aiding in skin repair and making scars and marks less visible: retinoic acid products, collagen building products, topical ingredients such as vitamin E (softens and moisturizes), zinc supplements, regular OTC scar creams, laser resurfacing. With that said, there is very little hope for improvement if the scars keep forming and your acne remains active. SO, YOUR ROAD TO IMPROVING ACNE SCARS BEGINS WITH ENDING ACNE. Realistically, deeper acne scars are more difficult to get rid of and some may never completely disappear. However they may be made significantly less visible and softer. Then, the proper make-up can do the rest. Different skin types and shades, your overall health, sun exposure and your age are also factors that make a difference in healing acne scars. You may want to consult with your dermatologist or an experienced beautician or esthetician about the specific options for your skin (and wallet!). This mask provides the best results if used once or twice a week and in conjunction with utilizing an acne treatment like AcnEase® that prevents new acne from coming. The mask softens the appearance of acne scars, making them less visible. WARNING: You may want to lick your face while applying this mask, but resist the temptation! Also, this mask is not to be used when you have many active pimples or cysts (lemon juice will sting when applied if so). you can skip step 4 if needed). Can be used 1-2 times a week. What part of milk are you allergic to? If you are simply lactose intolerant,it is absolutely safe to apply milk on the skin. Our skin is designed to actually keep the external factors out of your insides so it would be doing a poor job if it would let everything that touches it to get in. If the molecules are very small they may go through skin and get to your micro blood vessels, and some medicines are designed to do so. Unfortunately some chemicals can get to you also this way but milk is not one of them. 301 2 Hi Heather, What part of milk are you allergic to? If you are simply lactose intolerant,it is absolutely safe to apply milk on the skin. Our skin is designed to actually keep the external factors out of your insides so it would be doing a poor job if it would let everything that touches it to get in. If the molecules are very small they may go through skin and get to your micro blood vessels, and some medicines are designed to do so. Unfortunately some chemicals can get to you also this way but milk is not one of them. What if you are allergic to milk? Is it still safe to apply to your skin? If not, is there a substitute that can be used in place? Thanks! 296 1 What if you are allergic to milk? Is it still safe to apply to your skin? If not, is there a substitute that can be used in place? Thanks! Thanks for this tip! I just posted about how I am trying to treat my acne scars, Can't wait to try this! 263 1 Thanks for this tip! I just posted about how I am trying to treat my acne scars, Can't wait to try this!